Another group of interesting Barbie dolls came from the foreign Market. These harder to find dolls with some variation from the dolls from the United States are always a delight to add to any collection. The European and Japanese dolls were Mattel Exclusives. The Takara Barbie was a collaboration between Mattel and the Takara Company to develop a unique Barbie for the Japanese Market. After Mattel and Takara broke ties, Mattel had a new agreement with Bandai naming their company Ma-Ba and from that arrived the P.B. Store Barbies. And of course we can't forget the German Bild Lilli doll from 1955. 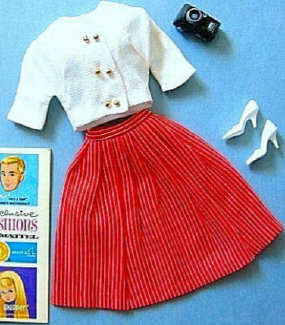 She's where it all started for Barbie back in 1959! Click the links below to take you to more detailed information on each!